Along with what they put in their bodies when they eat, many people are also concerned with what goes on their bodies when they use face and body washes. While there isn’t any hard evidence about how much of the ingredients in skincare products are absorbed through the skin, many people opt for an organic face wash to keep their skin looking its best. While some manufacturers say that their products are natural, it really doesn’t mean anything because the term “natural” isn’t regulated. However, “organic” is regulated by the United States Department of Agriculture (USDA). Companies that claim to use organic ingredients must pass stringent requirements. The ingredients cannot be grown using chemical pesticides, genetically modified organisms (GMOs) or chemical fertilizers. If a product passes all the regulations, then they can be certified as organic. Identifying a product as certified organic isn’t difficult. The USDA issues a label for any product that passes their requirements. It is a circular label that contains the letters USDA over a field. While most of the labels are green, there are some that are printed in black. Another way to ensure a product is organic is by reading the label. There will be an absence of synthetic ingredients, like fragrances, and most organic products will not contain parabens, sulfates, or phthalates. Parabens have been linked to cancer and hormone disruption while phthalates can interfere with fertility and the development of fetuses. This list of ingredients contains other chemicals that should be avoided when purchasing skincare products like face washes. Organic ingredients will be comprised of botanicals, clay, charcoal or other minerals and vitamins with which you may be familiar. If you’re looking for an organic face wash, here is a list of the top 10 we’ve reviewed for you. When we review products, we use a star rating system to help you know which are the best. Each face wash is rated from one to five stars, with five being the best. To choose our ratings, we research the products we’ve chosen to ensure they are organic. We also read testimonials from people who have bought the product to find any problems with it or to see how well it worked for them. The following products made our list of the top 10 choices for organic face washes. 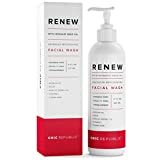 This Renew face wash is made from organic ingredients that help to moisturize your skin, restore its pH balance and protect your face from showing the signs of aging, such as fine lines and wrinkles. It is a foaming cleanser that plumps the skin and makes it look younger. The face wash also clarifies skin by keeping your pores clean and acts to fade dark spots and blemishes, so the tone of your skin is even. It is comprised of 74% organic ingredients, and it is suitable for both men and women. It is hypoallergenic, suitable for vegans and cruelty-free. Renew is made in the USA. 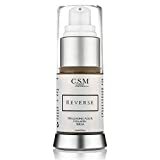 The Renew face wash by CSM is made to provide men and women with softer, smoother skin. It ensures it stays hydrated as it exfoliates and cleansing your face. It contains ingredients like elderberry and white willow bark that protects skin from damaging free radicals. Other ingredients like sweet orange and lemon leave your face feeling refreshed, and the oils and sugars from organic rose petals tones skin, including sensitive skin. 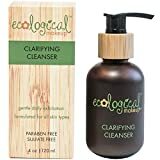 It also helps to even out skin tone because of Vitamins like A, B, C, and E.
The cleanser also diminishes skin pores, aids in fighting problems with eczema and psoriasis, plus the facial cleanser helps reduce the appearance of fine lines and wrinkles to give your skin a more youthful appearance. 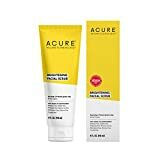 This 4.0-ounce tube of facial scrub is suitable for all skin types, including men and women who have sensitive skin. The scrub contains sea kelp, lemon peel and French green clay that removes dirt and oil from pores and gently exfoliates skin. It is suitable for use by people who live a vegan lifestyle, and their products are not tested on animals, so it is cruelty-free. This scrub is also available in a travel kit that includes shampoo, conditioner and day cream. This organic face wash is specially designed for men to add to their daily routine to cleanse and protect their face. 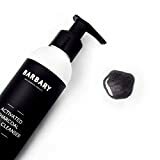 The activated charcoal acts to lift dirt, oil and other impurities from pores to keep them clean. As it does this, it helps to prevent pimples and blackheads from forming. If he lives a vegan lifestyle, he can apply this product to his face to clean it. Also, the company’s products are never tested on animals, so they are cruelty-free. Their skincare products are made in the United States, in small batches to maintain their quality. Although this cleanser foams, it does not contain sulfates to help it. It contains organic ingredients, and it has been rated number one by the Environmental Working Group, which is a non-profit environmental group that provides the public with information about toxic chemicals and other topics. The cleanser contains Vitamins C and E due to their antioxidants that help to repair the damage caused by the sun and other outside elements. Not only does it rejuvenate skin, but it reduces the signs of aging, such as fine lines and wrinkles. It is suitable for all skin types and use by either men or women. Its ingredients help remove dirt, oil and other impurities without depriving skin of the natural oils that keep it hydrated. The face wash can be incorporated into your daily routine because it is safe to use day or night to keep skin clean and protected. Some of the other organic ingredients include rose hips, chamomile, sunflower, avocado, and olive. The anti-aging cleanser by Eavara is specially formulated for women to help battle the signs of aging, like fine lines and wrinkles. It contains green tea that contains antioxidants to keep free radicals from damaging skin, which can age it. The Vitamin E it has maintains your skin’s elasticity and firmness. The cleanser also keeps the skin of your face stay hydrated by using coconut oil and tamanu oil. Its other ingredients have natural anti-bacterial properties that heal skin, so it looks and feels revitalized and provides a younger appearance. The cleanser is cruelty-free, and it has a lifetime guarantee. If you’re not satisfied with the product, it can be returned to the manufacturer at any time. This Dr. Woods facial cleanser can be applied to all skin types, including sensitive skin. It is made with organic shea butter to keep your face clean and hydrated. You can use it every day to take advantage of its ability to remove dirt and oil from your face without drying out your skin. It contains botanical ingredients that provide antioxidants that protect skin from damage caused by environmental factors like the sun, windburn, and pollutants in the air. If your skin is already dry or irritated, the cleanser can help soothe and soften it, which can give your face a more youthful appearance. Anyone can use this product, men, women, teenagers, and adults if they want healthier skin. This product is cruelty-free and suitable for vegans. 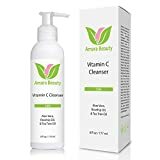 If you want a face wash that cleanses your face without drying it out or stripping it of all its natural oils, then the Amara Organics Facial Cleanser may be what you need. It not only cleans the dirt and excess oils from your face, but it does so without making it feel tight and stripping all the oils from the skin. It's formulated from organic ingredients to keep the level of moisture in your skin in balance. It also helps to remove make-up, but it's not just for women to use. Men can wash their skin with it as well, and it is made for all skin types. If you have sensitive skin, then you can use this cleanser as well without worrying that it will irritate your face. It is suitable for vegans, cruelty-free and it is made in the USA. If you are not satisfied with the product, contact the company for a full refund. They don’t require that you return the bottle. Ecological Makeup is an organic face cleanser that is made with activated charcoal to ensure that your skin and its pores become clean. It also helps to exfoliate dead skin cells from your face to give it a fresher, brighter appearance. The cleanser is cruelty-free, vegan and it comes with a 100% money back guarantee. Antioxidant-rich watercress helps protect skin from environmental damage. Cucumber replenishes and hydrates skin. Although it is made from gentle, organic ingredients, this Nourish face cleanser can dissolve the dirt and excess oil from your skin. It won't strip all the natural oils, so it doesn't irritate your face, and it helps keep it hydrated. It is also a good cleanser for women to use to remove makeup. It is made with cucumber to keep skin hydrated as the watercress acts to protect your skin from damage due to its high antioxidant content. It also contains other antioxidants and vitamins to make your skin look better. It is suitable for those with a vegan lifestyle, it is cruelty-free and its fair trade certified. When you're searching for an organic face wash or any other organic product, the easiest and quickest way to identify them is to look for the USDA’s organic label. If you don’t see the circular label on the bottle or tube, then the product isn’t certified as organic. 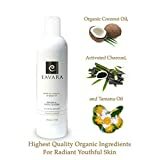 You should also read the label to become familiar with the ingredients like the organic botanicals and vitamins used in organic skincare products. If you’re not sure that a product is suitable for your skin, read testimonials online by people who have bought and used it to get their opinion. It can help you select the right cleanser for your skin type. Most organic cleansers are formulated to give skin pores a deep cleaning without irritating skin and stripping it of moisture. Just remember to look for the circular USDA organic label to make sure it is indeed an organic product.